Native to the Mediterranean region, considered an evergreen shrub with needles for “leaves,” this versatile herb provides a truly stimulating, system regulating, absolutely delicious cup of tea, hot of cold. Legend has it that upon the advice of who we might label today as a homeless person, at age 72, 14th century Queen Elizabeth of Hungary added rosemary to her health regime to restore her youthful vitality. After consistent use of this “rosemary water” tonic, she professed a renewed vigor, and soon thereafter accepted the marriage proposal of the 26 year old king of Poland. Today, popular with essential oil practitioners and aromatherapy enthusiasts, rosemary oil is used to treat hair and scalp issues. So if you’re seeking a potent hair tonic and not opposed to smelling like an Italian kitchen, go for the rosemary! 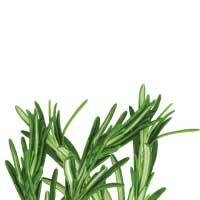 If you’re into cooking, you’ll likely be familiar with the fragrant, famous ingredient rosemary. Native to the Mediterranean region, considered an evergreen shrub with needles for “leaves,” this versatile herb sprouts tiny blue, lavenderish, and white flowers. Many people plant rosemary bushes for ground covering. It’s a hearty, drought- and pest-resistant plant, that can flower all year in temperate climates. Important these days as well, rosemary shrubs attract bees. 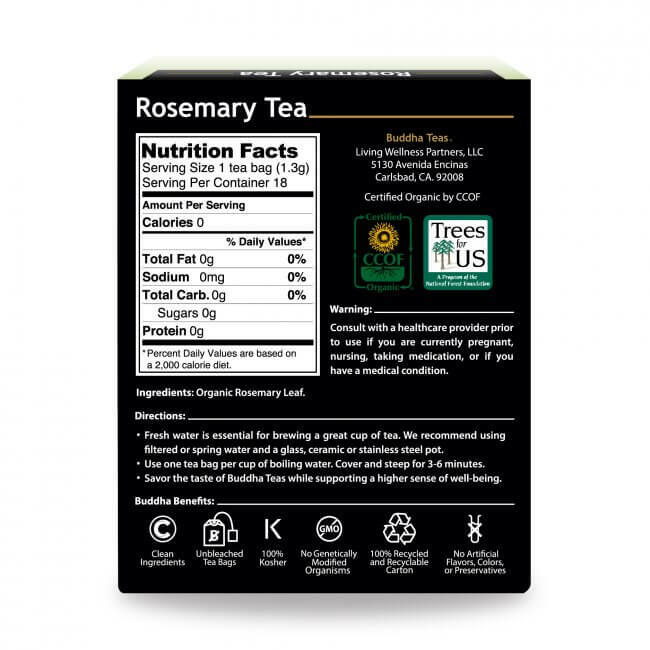 What Does Rosemary Tea Taste Like? Imagine traveling back in time to seaside Italy, where colorful rectangular dwellings dot the coastline. The scent of roasting lamb lingers in the air as you stroll along a pathway lush with greenery. A sweet subtle breeze washes over you, tickling your eyelashes, as it brings the calming scent of vibrant rosemary. A sense memory has been planted, an imprint you will carry with you for lifetimes to come. Pour boiling water over your Buddha Teas Rosemary Tea, cover, and plan to steep for 5-10 minutes, depending on how potent you want your tea to taste. The tea will not get bitter during a good, long steep. We love the scent of rosemary so much we leave our teabags on the counter and enjoy its fragrance until it disappears. I recommend this tea all the time. Can’t sleep? Try Rosemary Tea. Mind racing all the time? 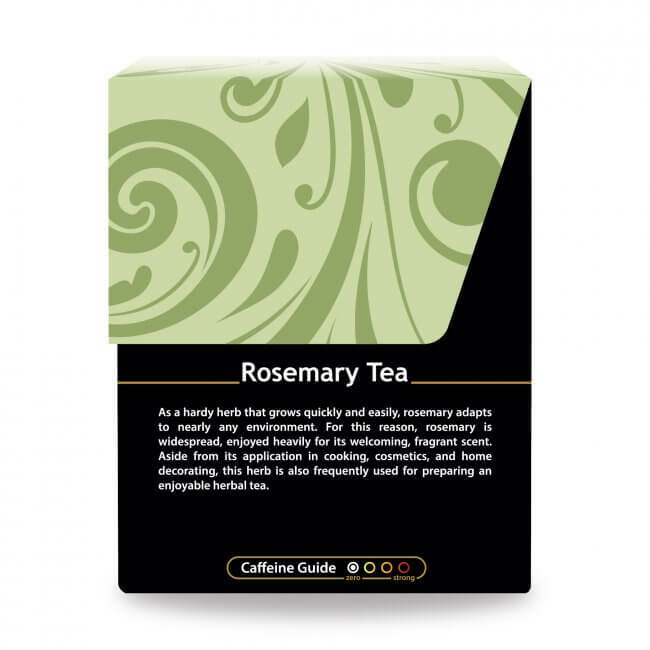 Try Rosemary Tea. Drinking too much caffeine? Try Rosemary Tea. I call it the No Joke Tea. Product recommended by a friend for the health benefits. Pleasant scent and delightful taste. Review Title: My favorite tea! 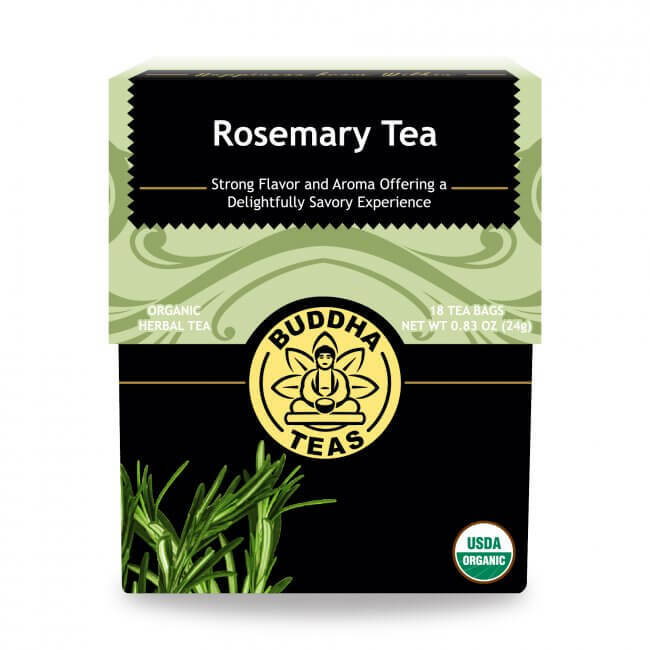 I am not a tea person naturally, but after tasting Rosemary tea which I bought solely for my woman, I have come to fall in love with this tea. It gives energy all day long, also keeps my brain activity at top notch. Have just finished one box, I'm sure as I continue I'll notice more benefits. order is sent with lots of safe boxes! I absolutely love this tea. It is now my favorite! It smells and tastes delicious. Thank you Buddha Teas!! !